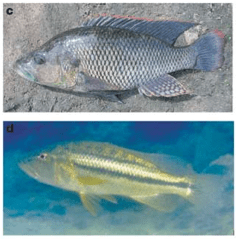 The haplochromine cichlid fish of the East African Great Lakes represent some of the fastest and most species-rich adaptive radiations known(1), but rivers in most of Africa accommodate only a few morphologically similar species of haplochromine cichlid fish. This has been explained by the wealth of ecological opportunity in large lakes compared with rivers. It is therefore surprising that the rivers of southern Africa harbour many, ecologically diverse haplochromines. Here we present genetic, morphological and biogeographical evidence suggesting that these riverine cichlids are products of a recent adaptive radiation in a large lake that dried up in the Holocene. Haplochromine species richness peaks steeply in an area for which geological data reveal the historical existence of Lake palaeo-Makgadikgadi. The centre of this extinct lake is now a saltpan north of the Kalahari Desert, but it once hosted a rapidly evolving fish species radiation, comparable in morphological diversity to that in the extant African Great Lakes. Importantly, this lake seeded all major river systems of southern Africa with ecologically diverse cichlids. This discovery reveals how local evolutionary processes operating during a short window of ecological opportunity can have a major and lasting effect on biodiversity on a continental scale.